Crows cause a lot of problems at this time of year by attacking windows on houses and cars. This is because it is the start of the nesting season: the crows are actually attacking their own reflections, thinking that they are rival crows invading their territory. 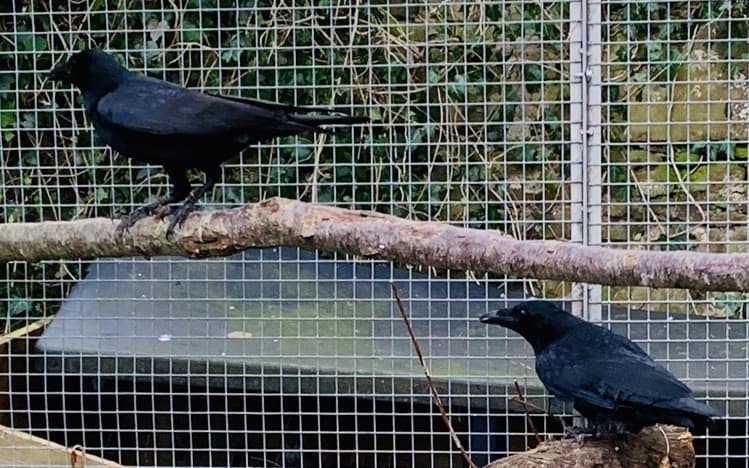 Having said that, some unfortunate customers get problems with crows attacking windows at other times of year: the two crows in our aviary in the picture had been attacking a customer’s windows all winter, which is quite unusual. We soon managed to get rid of the crow problem in Perth though by catching them. Crows have very powerful, thick, blunt beaks which they use like jack-hammers when they attack window glass and peck out the seals. This leaves the windows looking a mess and can cause a lot of expensive damage with seals, and even windows sometimes, needing to be replaced. These powerful beaks also help crows to eat a varied diet which includes young birds and eggs and even crabs in coastal areas. Crows might be part of nature but they are voracious predators – not what you want around your garden, particularly in the nesting season. Also, crows are quite large birds, weighing up to half a kilo and with a wing span of nearly 1 metre, and make a raucous cawing sound. It is pretty unpleasant to have these noisy, large birds causing a commotion and hurling themselves at the glass, especially when you’re inside the house. Crows, both the Carrion Crow and Hooded Crow, are classed legally as ‘pest birds’. This means that it is legal to control crows all year round, including in the nesting season. Crow control must be done under licence though, and the legal conditions of the licence must be observed. Control methods include trapping, shooting, scaring, bird-proofing and interference with nests, eggs and young.